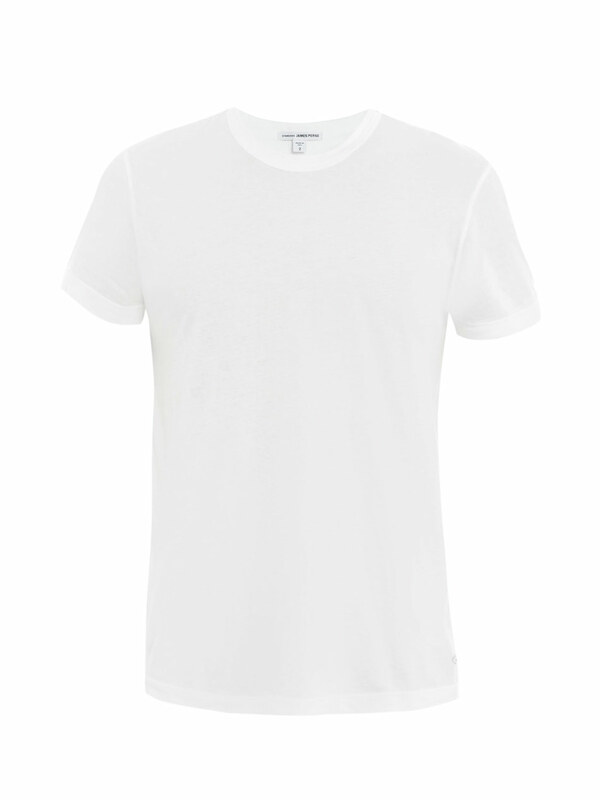 If you're looking for a casual yet on-trend ensemble, wear a James Perse crew neck t shirt and white chinos. These two items are totally comfy and will look stunning when paired together. You could perhaps get a little creative when it comes to footwear and lift up your ensemble with white leather oxford shoes. 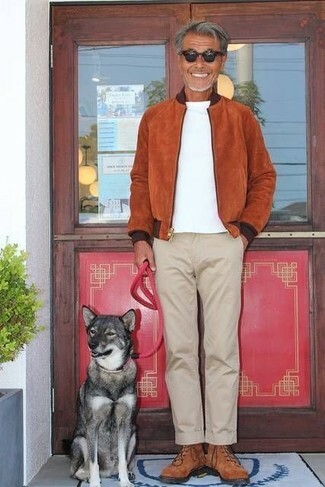 If you're in search of a casual yet on-trend getup, wear a James Perse crew neck t shirt and beige chinos. These items are very comfy and will look wonderful when paired together. 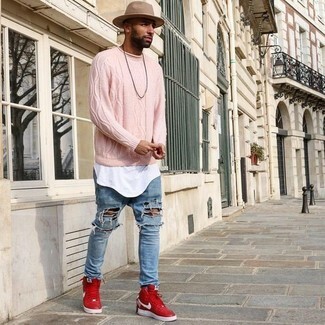 For something more on the daring side to complement this ensemble, grab a pair of brown suede high top sneakers. If you're in search of a casual yet sharp outfit, try teaming a James Perse crew neck t shirt with blue jeans. These pieces are super comfortable and look amazing when worn together. 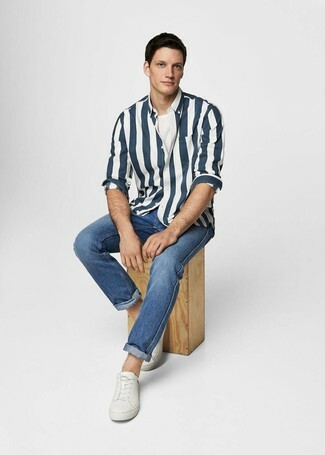 We all seek comfort when it comes to dressing up, and this combination of a James Perse crew neck t shirt from MATCHESFASHION.COM and light blue print jeans is a practical illustration of that. 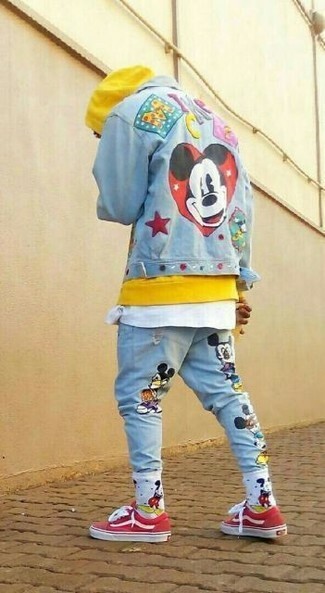 When it comes to footwear, this outfit is complemented wonderfully with red low top sneakers. If you're all about practicality dressing when it comes to your personal style, you'll love this on-trend pairing of a James Perse crew neck t shirt and light blue ripped jeans. When it comes to shoes, this getup is round off nicely with red high top sneakers. 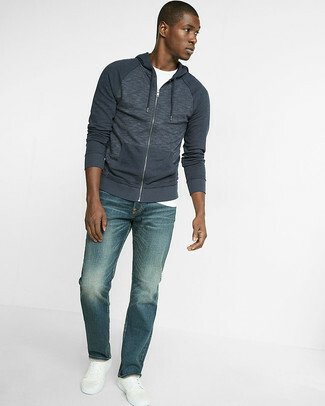 If you're hunting for a casual yet stylish getup, go for a James Perse crew neck t shirt from MATCHESFASHION.COM and blue jeans. Both garments are very comfortable and look great paired together. A pair of white leather low top sneakers looks proper here. 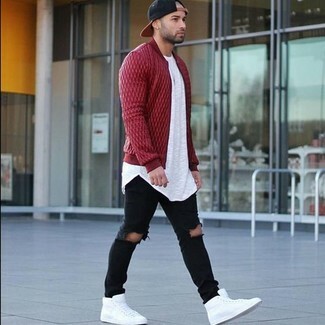 If you prefer relaxed dressing when it comes to fashion, you'll love this neat combination of a white crew-neck t-shirt and black ripped skinny jeans. 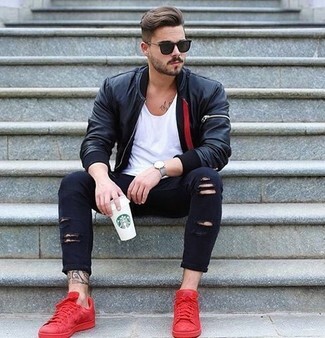 Bump up the cool of your outfit by rounding it off with red low top sneakers. If you're searching for a casual yet on-trend ensemble, wear a James Perse crew neck t shirt and blue jeans. These two garments are totally comfortable and look stunning paired together. 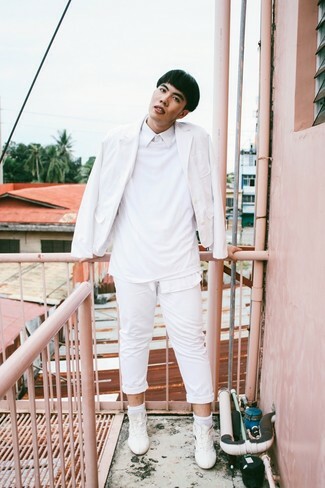 When it comes to shoes, this outfit is finished off perfectly with white leather low top sneakers. If you're all about feeling relaxed when it comes to dressing up, this combination of a white crew-neck t-shirt and black ripped skinny jeans is what you need. Lift up your look with white leather high top sneakers.